What would happen if we mashed up Super Sad True Love Story and A Clockwork Orange? 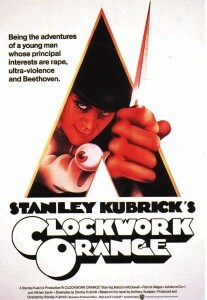 Published in 1962, A Clockwork Orange was set in the not-so-distant future when a gang composed of Alex and his droogs (friends) could wreak ultra-violence all about them. Super Sad True Love Story, published in 2010, was set in a “near-future dystopian New York … dominated by media and retail.” Could they be the same story? So Burgess famously invented a language – called Nadsat – that included roughly 600 words derived from Russian. Droogs are friends, a britva is a blade or razor, chepooka is nonsense, devotchka is a girl, polezny is useful, rot is a mouth, zheena is a wife, and horrorshow is cool, great, or super. It takes a little while to get used to Nadsat but, once you do, it flows easily. I re-read A Clockwork Orange because I wanted to see how it had held up. Did Burgess’s trick work? Did Nadsat still sound futuristic? I have to say that it did; it still seemed to be a future language in an undefined but somewhat familiar landscape. While the language held up, everything else seemed so 60’s. At one point, Alex and his droogs invade a house where an author has nearly finished typing a novel (called A Clockwork Orange). The gang seizes the typescript and shreds it in front of the author. It’s the only copy. The work is forever lost. But wait … a typewriter in the not-so-distant future? How lame is that? The language worked but the technology forecast didn’t. Gary Shteyngart, the author of Super Sad True Love Story, may have the opposite problem, which is why a mash-up might work. I got to thinking of this when I read Shteyngart’s article, “O.K., Glass” in a recent issue of The New Yorker. The article recounts Shteyngart’s adventures as he wanders around New York wearing Google Glasses. (Shteyngart is one of the Google Glass Explorers, who are sometimes known as Glassholes). Shteyngart is addressing the same problem as Burgess: how do you keep a novel fresh? Burgess approached it through language, Shteyngart through technology. Still, I submit that Shteyngart did a better job on future technology than Burgess, while Burgess did a better job on future language. That’s why I’m proposing a mashup. Burgess died in 1993 so any mashup will have to come from Shteyngart. Plus, Shteyngart was born in Russia so Nadsat should be a snap for him. So what do you say, Gary? Would you give us a mashup of two great novels? It would be totally horrorshow.